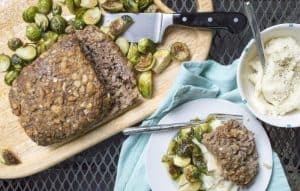 This classic meatloaf is my favorite meatloaf. 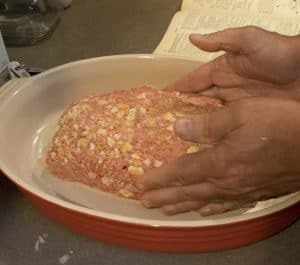 I grew up on this meatloaf recipe. In our house dad always made the meatloaf. It was his dish. My mom would try to replicate it, but it was never the same. It’s my ultimate comfort dinner. He got this recipe from an old Joy of Cooking cookbook that had been passed down from my grandma. 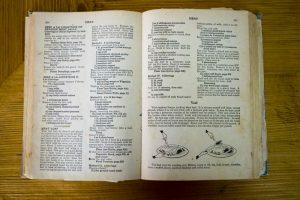 The cookbook is falling a part, but I love it! He says the key is finding the right pan, and adding water onto the loaf before it bakes. First you mix all of the ingredients into a bowl. Mix everything together, and roll into a ball. 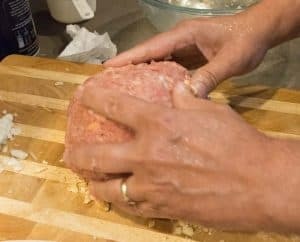 Roll the “meatball” into some crumbled Ritz crackers, and then form into a loaf. Then pour 1 cup of water around the loaf, and then bake at 350 for around 1 1/2 hours. 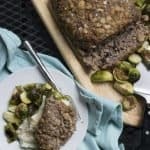 Don’t forget to make a meatloaf sandwich with the leftovers! 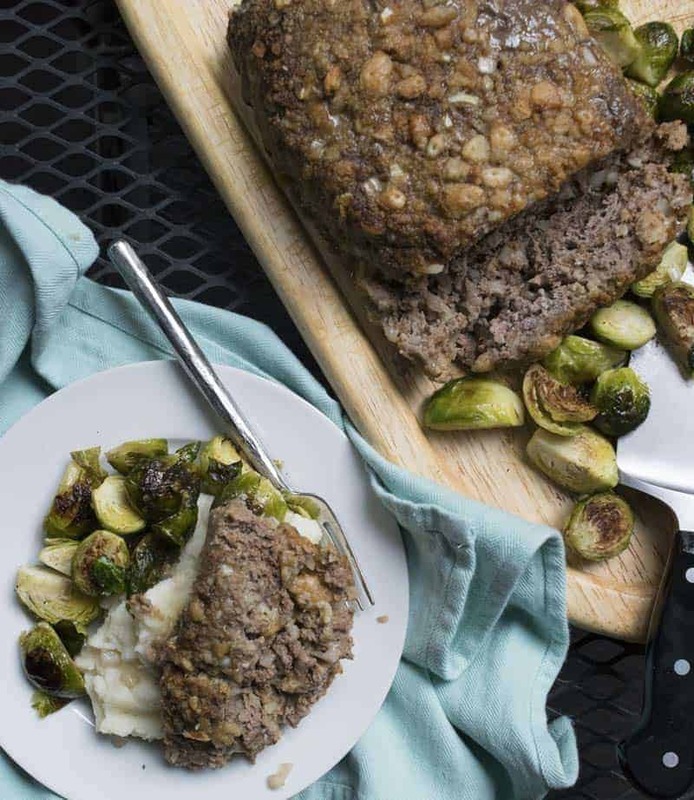 This meatloaf is a classic comfort food. 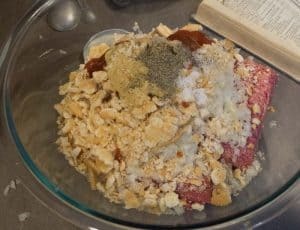 Mix all ingredients EXCEPT 1/2 cup of cracker crumbs and water. Form the mixture into a ball. 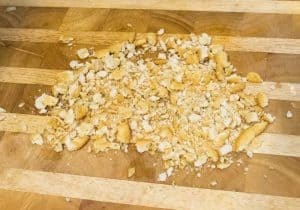 Then roll into reserved 1/2 cup of crumbled crackers. 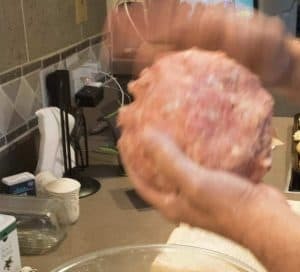 Place the meatloaf ball into a medium size casserole dish. Pat the ball into an even loaf shape. We use lean ground beef to cut back on the fat. Ritz crackers work best. 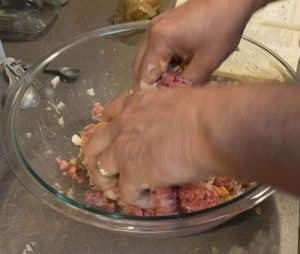 Leave the meatloaf in it’s cooking juices when serving to keep moist. 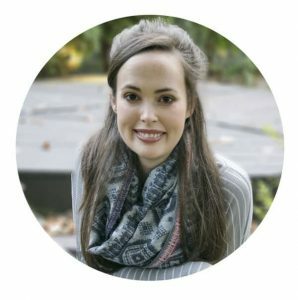 Do you allow guest post on your site ? I can provide hi quality posts for you. Thanks Brodie! Right now I am not letting guests post to the site, but I will let you know if I change my mind!